Throughout the years Renfrewshire has had many successful players that have attained the honour of being a County Champion, a West of Scotland Champion, a Scottish Champion, a Scottish Internationalist, a British Internationalist, and a Curtis Cup Player. - Click on the video below to reveal our Scottish Champions. Our most recent Curtis Cup player was Eilidh Briggs who was selected in 2014. The others were Dorothea Hastings (nee Sommerville) 1958. Maureen Richmond (nee Walker) 1974, Wilma Leburn (Nee Aitken) 1982 and Shirley Lawson 1988. In 2012 Carol Fell was made the Ambassador for Renfrewshire County at the Curtis Cup at Nairn Golf Club. Tegwen Mathews was the Captain on both occasions. To see some photos and videos from the last 3 Curtis Cup matches CLICK HERE. The 2018 Curtis Cup was held in June 2018 in the USA. There have also been many members that have held top national administrative posts. The most well known was Kathleen McNeil MBE who was LGU President in 1991 and Honorary President of the SLGA from 1991 until her death in 2007. Most recently was Beth Paterson who was Chairwoman of the SLGA and was involved in the amalgamation of the S.L.G.A. and SGU in 2015 to now what is known as Scottish Golf. 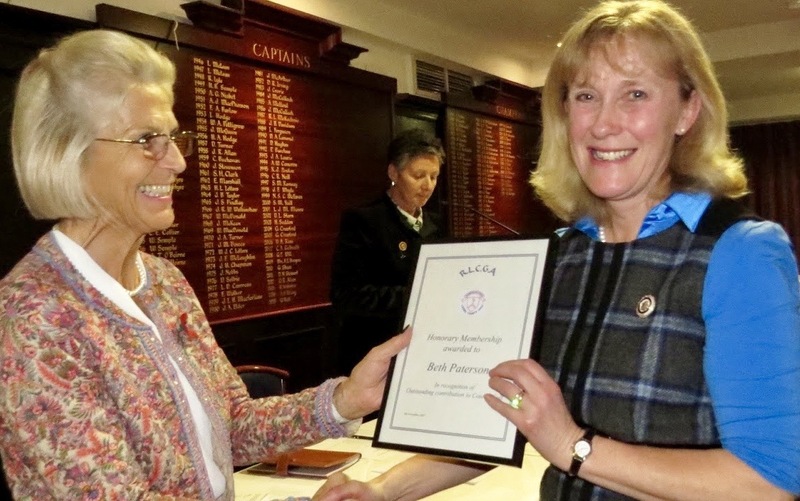 Beth received Honorary Membership of the County in 2015. All achievements that members have had both on and off the course are in the 2009 Centenary Book and also can be found summarised at the annual AGM's on the RLCGA BLOG.